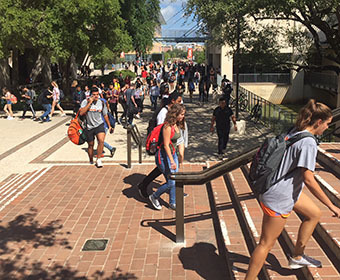 (Sept. 28, 2018) -- More students than ever before are learning, researching and engaging at UTSA. A newly released report from the UTSA Office of Institutional Research (OIR) reveals that 32,101 students are enrolled at UTSA this fall, the highest enrollment in school history. The university also improved its four and six-year graduation rates by 3 percent each this year. UTSA’s enrollment growth is an increase of 4.7 percent from one year ago. That equates to more than 1,400 more students working toward a degree at UTSA this year. The freshman population also increased for the second straight year to 6,161. The majority, 27,312, are undergraduate students; nearly 4,200 are pursuing graduate degrees. Additionally, UTSA released its 2018 retention and graduation rate numbers, indicating significant progress in its efforts to advance student success. The university’s three percent increases in its four and six-year graduation rates bring those totals to 25 percent and 40 percent, respectively. Additionally, UTSA has intentionally and proactively put programs in place to remove obstacles to graduation and help students succeed. One example is proactive advising. UTSA moved from group advising to centralized advising in 2014. Under the new structure, each undergraduate is assigned an academic advisor. More recently, pilot programs have focused on the freshman cohorts, student retention and identifying students at risk according to their early performance in success marker courses, courses that are critical to the completion of particular degree programs. These initiatives have resulted in increased retention and persistence among UTSA undergraduates. Another asset for student success is the creation of a Graduation Help Desk (GHD). Established in 2017 and fully operational in January 2018, the GHD is a one-stop resource for students who need assistance to overcome obstacles to graduation. Help Desk personnel provide counsel to students and help them navigate the university to enable student success. UTSA also implemented its First to Go and Graduate program in 2016. The program includes a first-gen and transfer student center, where students receive coaching from peer mentors and first-gen faculty as well as a First-Gen Council, which produces events to promote a campus culture that is supportive to first-gen students. This week, the Strategic Enrollment Task Force issued its final report, the first phase of the university’s new Strategic Enrollment Plan. This Phase One plan outlines strategies, timelines and budgets to increase UTSA enrollment and maintain its market share of Texas college-bound students. Integral to this effort is a focus on academic areas that provide market advantages by aligning with workforce needs, playing to institutional strengths in business, data sciences, STEM and education. By the end of this first phase in Fall 2023, UTSA will be on track to have an enrollment of approximately 38,400 students comprised of some 33,000 undergraduates, 4,600 graduate students and 800 post-baccalaureate students. These increases will bring an additional $13 million in tuition revenue and $5 million in fee revenue to UTSA. Looking further out, Phase Two of the plan will result in more than 45,000 students at UTSA by Fall 2028. This will put UTSA’s enrollment in alignment with some of the most prestigious research universities in Texas. With that in mind, Eighmy says that the campus infrastructure must keep pace with enrollment, a central focus of the campus master plan initiative. “Ultimately, all these efforts will position UTSA with a foundation for moving forward as a prosperity engine graduating the world-engaged civic leaders of tomorrow,” he added.